PricePlunge was founded in 2010 by SpaceBound, Inc. which are the owners of NothingButSoftware, BargainStation and a few other sites. The PricePlunge business model is, however, a bit different since it's a deal a day site. In addition to this, the site also lets you earn points which you can exchange for discounts on future purchases. As for the item selection, PricePlunge deals range from things for the home, electronics and more. 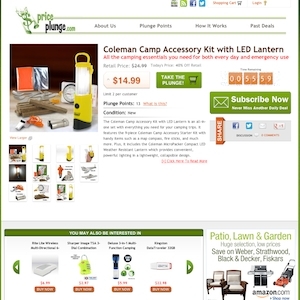 Priceplunge.com currently ranks #132 amongst sites offering online deals -- Mountain Plus Outdoor Gear ranks #131. In the General Merchandise category, PricePlunge ranks at #42 -- RedTag ranks #41. Amongst all deal a day sites, PricePlunge ranks #24 -- RedTag ranks #23. Offers computers & accessories, electronics, housewares and more.